Bhaktimarga Swami, the Hare Krishna walking monk, stops for a break near the Pilot Truck Stop on Route 93 in Sugarloaf Township Wednesday after walking 8 miles of his daily 20-mile trek. Swami left Boston, Mass., on September 20 walking his way to Butler in western Penn. by walking 20 miles per day. 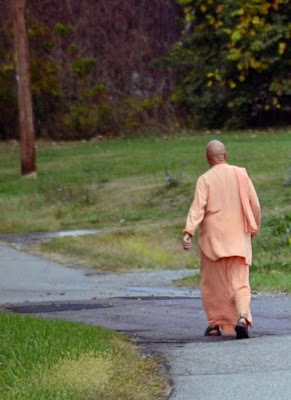 On Wednesday, the Hare Krishna monk passed through Butler and Sugarloaf townships on his 900-mile pilgrimage to western Pennsylvania in memory of his guru, A.C. Bhaktivedanta Swami Prabhupada, who founded the International Society of Krishna Consciousness. Swami hopes his 20-mile-a-day hike will raise awareness to his spiritual teacher and all teachers. He started his spiritual journey in Boston on Sept. 20 and celebrated his 63rd birthday on Monday while on the road sleeping under the stars. 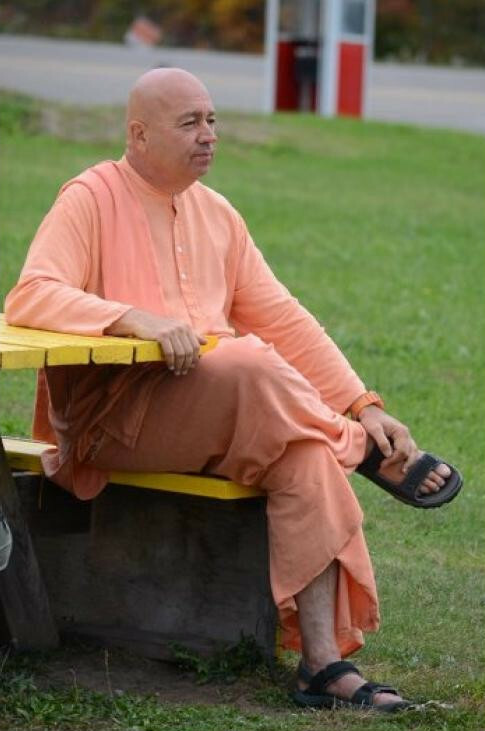 Bhaktimarga Swami stops for a break near the Pilot Truck Stop on Route 93 in Sugarloaf Township. Most of his walk through New England and even Pennsylvania was among the mountains and trees, and on Wednesday opened up to the state’s rolling hills and rural farmland, he said. He joked his traditional orange garb blended in with the pumpkins. Swami believes walking allows people to experience the world and see the sights, he said. Walking also lends clarity and gives people time to process their thoughts and future plans, and reflect on their past. Plus, he meets new people on his journeys. The upbeat monk said he waves to people passing by and often shares a laugh with those who stop to talk. 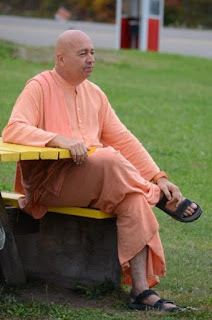 “They can be fun,” Swami said, recounting the day a police officer approached him one morning, because someone called about someone in orange lying on the side of the road. The officer said he checked out the report because prisoners who escape would be in orange jumpsuits. One of the folks he met along the way, Tre’von Stapleton of Windsor, Connecticut, joined him on his journey. “I asked for a guiding light from the universe and a few days later we met,” he said. The pair, who have a support vehicle following them, hoped to log another 12 miles before stopping for the night on their westward pilgrimage. After reaching Butler, they’ll return east to New York City.